Transparency Market Research (TMR) in a new study found that the global district cooling market exhibits the presence of numerous regional and local players due to the increasing demand and high preference for local products among customers. The prominent players in this market are focusing on product innovation and technological advancements, which is likely to escalate the competition within the market over the forecast period of 2016-2024. Some of the prominent players in this market include Frio Brasil Refrigeracao Ltda, Qatar Cool, Emirates District Cooling LLC, Singapore District Cooling Pte Ltd., Keppel, Engie, Veolia, Enwave Energy Corp, and Aecon Group Inc. 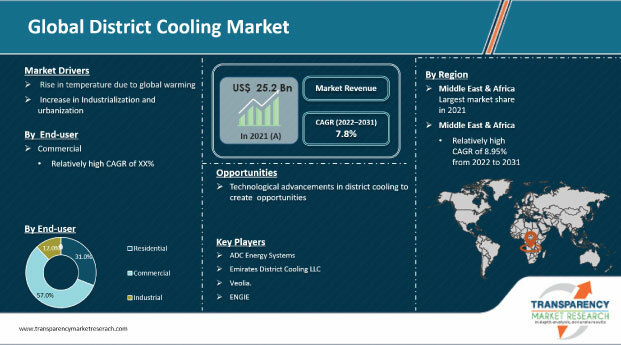 These players are focusing on to offer more cost and energy efficient cooling products, to strengthen their competitive strength in the market.